At just a month and a half from the previous release, Firefox 6 is now available for download! 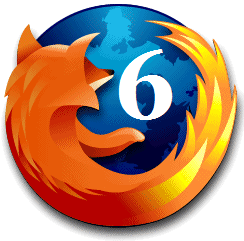 The first major change came not with Firefox 6 or version 5, but with Firefox 4. In fact there was a near ever closer to Chrome, especially in terms of design and functionality. Generally when we think at Firefox, since version 4, 5 and now Firefox 6, come to our mind some key features such as protective about the abrupt termination, 3D web experience, hardware acceleration, speed and better performance, and security of the increasingly high consisting of rapid identification of sites, private browsing, eliminating suspicious behavior, integration with antivirus programs, secure connections, anti-phishing and anti-malware, parental control, customizable security, eliminating the safety history and many other features. What's New in Firefox 6? Firefox 6 is said that it would have solved many bugs, although a good portion of them are presented as news, anyway the gain most from version 6 are web developers seem to be considering the large number of features available in menu. Also Firefox 6 has changed in order to obtain an enhanced security and performance, say developers, but ... as normal user, you'll not see a big difference. Other news are related to the easier administration of tabs and more efficient control of passwords, extensions and plugins, and that performance consumes less RAM with Firefox 6. The most surprising news about Firefox 6 is that you have the opportunity to install it on mobile devices that using the Android OS from Google. It is said that this time the CPU and RAM of smartphone or tablet will be less used. Download it free here: Download!